I will be picking up my very first german shepherd pup in about 3 weeks!! I have done so much reading, and studying on how to raise her and keep her happy. One thing I havn't been able to find is the size crate she will need when she is full grown. I will be getting this crate now, and portioning it off until she grows into it. I am looking at one that is 48Lx30Wx32H does this sound like a good size crate for when shes full grown? (crate says will hold up to 110 lb). Any help is appreciated!! Thanks! What a great question. Yes, the wire crate size you have mentioned here, 48Lx30Wx32H, sounds absolutely perfect. 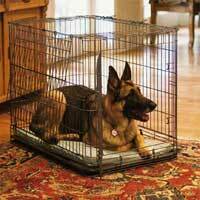 And just make sure that you get the kind that has the moveable partition so that you can adjust the size of the dog crate as he puppy grows. This is probably the biggest requirement that you really need to check for. And a wire crate is a great choice to buy. Another thing to look for is additional doors if possible since these can be quite helpful too and a handle to help carry the crate if needed. As well as a plastic pan in the bottom. So if you can find a wire dog crate that fills all these helpful tips above you will be buying an important piece of equipment that should last your dog for years to come. And thanks for asking. Comments for Need help buying my first crate for puppy! Fist let me say Congrats on your puppy! Enjoy this time with your puppy, it is the Best time, teaching, training and bonding which will be a lifetime companion. I was never a "crate person" but when I got my 12 week old puppy Mia from a lady who couldn't take care of her properly, she bought a crate for her, along with everything else a puppy needs. Remember a crate is not a babsitter and a puppy can't " hold it" for hours on end. You hear a dog isn't going to soil where they sleep but that's not true especially puppies their little bladders can't hold for a long time and they will soil their bed. I would get a very large crate. Your German Shepherd will be your Protector take good care of her and she will always take care of you! Before I got my 8 weeks old GSD puppy, I bought him a wire crate in size LARGE. It seemed so huge compared to the little puppy that I brought home. But my puppy grew very fast and when he outgrew the crate by the time he was 6-7 months. So I bought him the largest crate the company makes - GIGANTIC. He is now 3 years old and he is very comfortable in his crate. Whenever he feels like it, he goes into his crate (which he absolutely loves) and takes a nap. Keep in mind that German Shepherd puppies grow fast and they will be big dogs when they are fully grown. Enjoy your new puppy.